Arco-Íris (Leiria, Portugal) on 21 September 2008 in People & Portrait and Portfolio. Wouldn't you just die to have someone do this to you, get down on one knee with a bunch of flowers...hhahha this image really made me smile, love indeed! Awe romance is still alive....yeah!!!! Great capture...bags of interest on so many layers....What was this about? ...The total disregard by the other group. Muito interessante este momento que conseguiste captar. Such beautiful colors...and I like the title which you've chosen for this romantic image! Such an interesting photo, so many things to enjoy! Was it real? 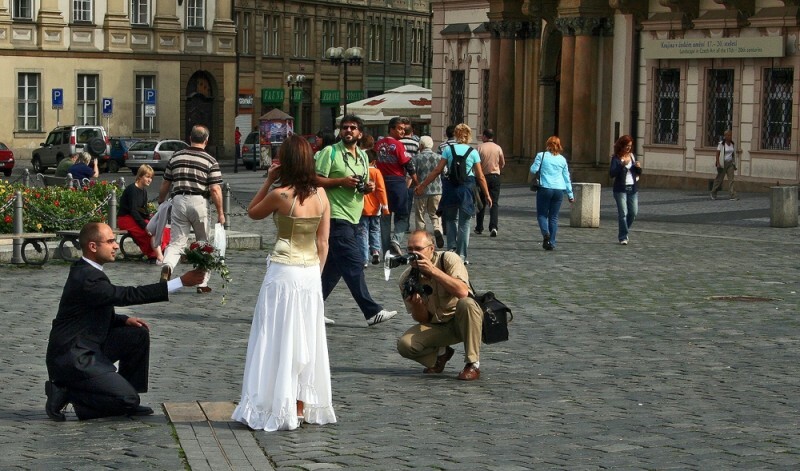 Why two photographers? Another couple walking hand in hand in the background. Love everywhere! Nicely done. Vivid colors! Wonderful imaginary scene capture! Que seja infinito enquanto dure. @Sérgio Aires: Essa frase é tão triste, incoerente... se acaba, não é infinito. Awesome shot - I love how you've captured the action of the street!! Your previous picture: cute! and the graining works so well, wonderful. This picture: Only the photographers appreciate the beauty of their subject, a shame that all other people don't see it. That's what happens so often in life. A symbolic picture! I mean, only one photographer notices it, the other one looks at what I think is the church tower. There are so many facets to the photo that it takes more than a brief glance to comprehend the entire scene. Had you cropped the photo to just the couple it would not have done the scene justice. Great timing on this photo. Love this one. A great moment well captured. Une très belle atmosphère romantique. Extraordinario ángulo esta toma sobre un cúmulo de gestos y gente desprevenida. Me gustó ana Lúcia. Saludos. Haha, the groom's 'authentic' pose is a bit hilarious :-) Well captured! The pose of the man giving the flowers is great. Um momento engraçado. Mas com tanto fotógrafo à volta já devia estar preparado, não? ah ... romance. good eye, and I like the slight mystery of the fact that the bride is turned away. Gostei do momento, a forma com tudo o resto esta tão disperso em relação ao cenario criado para os noivos equilibra a foto. Ainda para mais, está ali o "desgraçado" a dar o ramo e ela não liga nenhuma. hahhahha Se calhar ele é uma peste!! Fantástica foto de calle , eso se llama capturar el momento ! , bien hecho ! Awesome candid shot! Great colour and clarity!